Tania Vaughan: Should a wife submit? If any question is going to have people jumping to speak - it is certainly this one. I was intrigued this morning to hear the responses as this question was posed on Premier Christian radio, after the publication of a new book called "Get married and be submissive". The book has proved a surprising hit and a cause of much anger. I love this question because over the years I have worked through this and done a complete turn around on how I feel about being a submissive wife. When I came to Christianity at 28 any mention of submission would set me off on a rant about equal rights and not being walked all over and mistreated. Ten years later I can see that a lot of that reaction comes out of a complete misunderstanding of what the Bible actually means. I know now that biblical submission, is actually a good thing. One comment on the Premier Facebook made me smile, because it voiced what my fear had been. The young man said "If my wife were submissive all the time I'd be bored within seconds... we both thrive on being strong characters." My fear was that if I was submissive it would mean I was weak (Tweet this). In fact my character is probably stronger now than it has ever been. Submission comes from a strength and confidence knowing whose you are and where your husbands love lies. 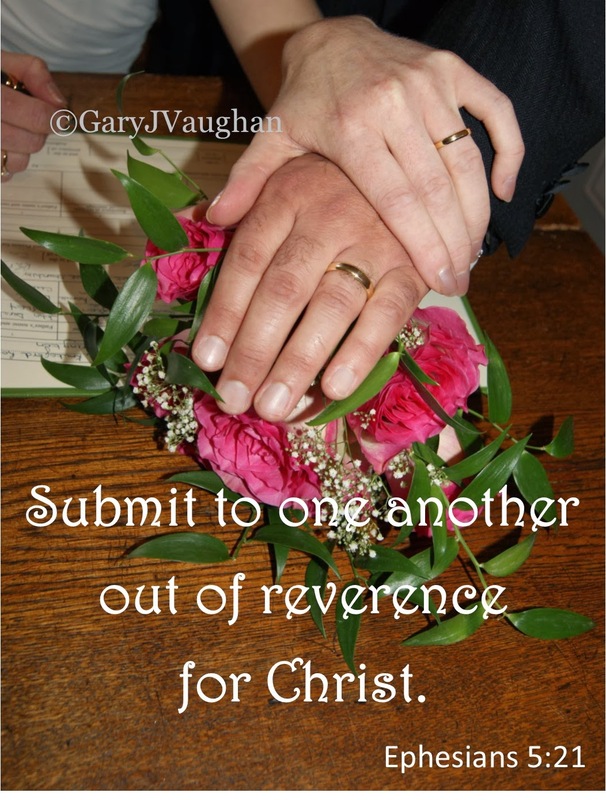 I can submit to my husband only because I know he loves Christ above all else. Knowing how much I am loved by God and my husband makes submission in obedience to God a natural step, my character becomes even stronger as God takes the place of self. What I discovered looking into Biblical submission is that we often submit in many ways without even realising we are doing it. Let me give you an example I shared with my discipleship group, whose faces were a picture when I said we were going to learn to be submissive! You have had a falling out with your spouse, friend, sibling, colleague (anyone) and you can't wait to get round to your best friends house to share your hurt, voice your feelings and cry on her ever ready loving shoulder. She opens the door, you open your mouth to speak and notice that she's been crying - what do you say? Of course, you push all your hurt and feelings aside, you hug her, make the tea and listen as she pours her heart out. 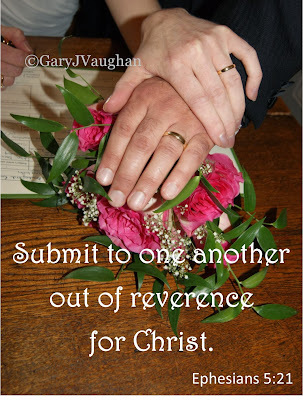 Biblical submission is about putting your own needs aside to meet the needs of another. It is about not having to say 'me first'. This is done out of love and that is why it is important to understand that you are submitting to your husband who loves you. It is not the world definition of the word submission where it can mean abuse from a husband who does not love you in a Christ like way. It's great that this book is written by a woman, Costanza Miriano, who has also written a similar book for men called "Get married and die for her." She is married, a writer, speaker and a journalist, she is not a down trodden wife. I am a woman of strong character, I am a woman of strong faith and I try everyday to submit to the will of God for my life and part of that is submitting to the love that my husband pours out on me. And he submits to me; as I travel to speak at conferences, he takes care of our son, he prays as I run courses for young women and in many more ways, we submit to each other. I tried doing it the other way and it's a bit like the saying that too many cooks spoil the broth. Two engines pulling in opposite directions will tear the middle apart. Be encouraged ladies not enraged, God knows what he is talking about when he tells us to submit to our husbands - but be sure that he means in a biblical loving marriage where your husband also submits and loves you as Jesus loves the church. If this subject has touched you or you struggle with understanding biblical submission, or you would just like to chat more about this subject then please contact me, I'd love to hear from you and encourage you as you live in submission to Christ. I find it's another case of how a word has 2 very different meanings 1- in the worlds eyes, 2 - how God intended it to be. It's a subject that causes a lot of reaction, and it is true that it has been and still is abused. But in the true Biblical sense it is freeing, loving and respectful to both the husband and wife, if Jesus is at the centre of their marriage..
You've shared this very honestly and very thoroughly. It's often overlooked that God's command for wives to submit is preceded by a command for all believers to submit to each other - including husbands and wives! We would be wise to view marital submission in the greater context of God's command to Christ-followers to prefer each other and esteem others more highly than we do ourselves. In this way, husbands obey the command to show love to their wives, and wives obey the command to submit. I'm glad you linked this up with us at Grace & Truth!